FAB UNLINED DRESS BY TU IN VG CON SIZE UK 18 BUST 44"
THIS BEAUTIFUL DRESS IS TOP QUALITY RUBBER LATEX (NONE OF THE FLIMSY STUFF HERE!). MISFITZ ALTERNATIVE WEAR. ESTABLISHED 1990. Misfitz black rubber latex military style dress, featuring contrasting red latex stars, stripes and pocket details. Hearts & Roses dress black & white rose pattern, side zip, button collar neckline, satin waist tie, cap sleeves. I have size 10, 12 & 16 available please message me what size you require. Velvet collar and velvet embossed flowers. Length (waist to hem) 20". Button fastening on the back of the neckline to give a keyhole detail. Length (shoulder to hem) 35". Fab Warehouse Black & White Floral Dress. Cap Sleeves. Button Fastening to Front with Tie Belt. 100% Cotton. Has a shirt style top half with open collar and buttons down the front. Ruffle detail down either side of the buttons. Short capped sleeves, these button up at the cuffs and there is a smaller ruffle detail over the shoulder seam. Chinese style floral print tunic dress with mandarin collar. Fully lined. Length from underarm 26”. 5% elastane. Pattern: Tartan. Denim Waistcoats. Denim Jackets. Colour: Black. Material: Acrylic Polyester Blend. Size Guides. Size Guide. Jumpers & Cardigans. Bomber dress. Black in black stripes effect. Gathered on the bottom hem. All length down the front buttons fastening. Been used not too often. Collared neckline. NEXT Black Linen Button Up Shirt Dress. I do not list clothes that I would not be happy to buy myself. A gorgeous shirt dress from NEXT. Collared button up dress with pockets. Cap sleeved. A really lovely dress. Beautiful Glamorous mini dress in extra small size. Lovely black cap sleeved dress from M&S with detailing around the neckline, size 12. Worn but in excellent condition. Pull the looks! Very feminine and elegant design. In pencil line. Length about 100 million. 65% polyester, 30% viscose, 5% elastane. MISS MUFFET SPIDER. HELL BUNNY. Beautiful, alternative style, black velvet stretch mini dress. Ivory collar with black embroidered spider and web finished with black ribbon tie. Fitted bodice with white glass look decorative buttons to front. MINUET BLACK LINEN BLEND DRESS. DOUBLE BREASTED BUTTON FASTEN TO FRONT. BUCKLE FASTEN BELT TO WAIST. KNEE LENGTH SKIRT. CAP SLEEVES WITH PLEATS. DRY CLEAN ONLY. FULLY LINED IN CHECK PRINT. 2 FALSE FLAP POCKETS TO FRONT. Ivory cream vintage dress. Fully lined, beautiful dress in fab condition. Black floral velvet Chinese style tight fitting dress by Charlotte Halton. Mandarin collar with button fastening. Mannequin is a size 10. THIS BEAUTIFUL SHIFT DRESS, IS IDEAL FOR DIFFERENT OCCASIONS. 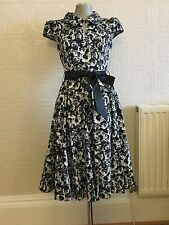 A used dress from Atmosphere, black with floral pattern, size 8. Short cap sleeves, covered buttons and half belt. CLOCKHOUSE. BLACK PRINT COTTON WRAP DRESS. MANDERIN COLLAR. SIZE 18. CLOCKHOUSE BLACK PRINT COTTON WRAP DRESS. Stunning formal dress with a front pleat detailing and 3/4 length sleeves. Pit to pit 21". Perfect for a formal event. Lovely Dress For The Season In Excellent Used Condition. Lovely Dress For The Season In Excellent Used Condition. Collared Neck Long Sleeves Classic Fit. Length 38".